When the spat between LWL and ST started, I thought that this is just a little squabble out of something we commoners are so used to: CENSORSHIP of the 153th ranked newspapers in the world. It was supposed to be just a little storm in the tea cup without anything we do not know. The interesting twist happened on 10 Apr 2016, Sunday. 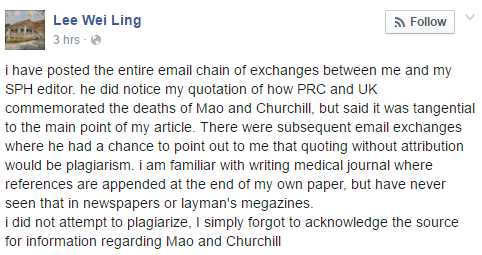 LWL has posted her emails with the ST editor on her Facebook, apparently out of great frustration. 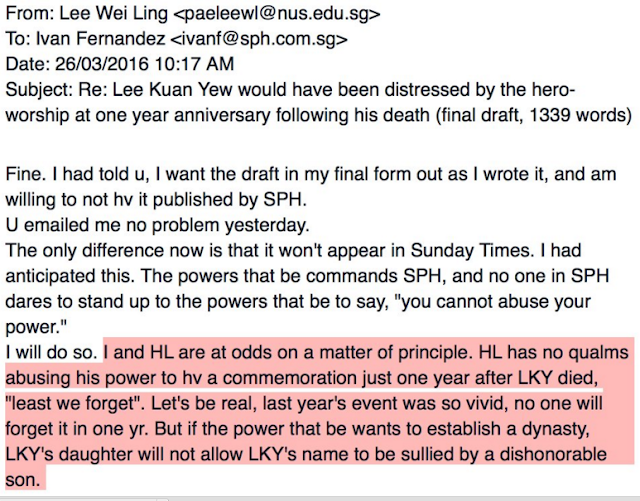 Among these email exchanges, LWL has shown dissatisfaction that the editor has kowtow to her own brother and has shown great frustration that her father's name has been used to help him build a "dynasty". Embedded among these emails were disparaging words and criticism of her own elder brother. This was the greatest shocker in Singapore's political history. The last time when someone tried to suggest Singapore is a "political dynasty" (i.e. New York Times), defamation suit was thrown swiftly against such insinuation. But this time round, this was done by the Prime Minister's very own sister! The Prime Minister was quick to rebut his own sister by denying that there is any "political dynasty" in construction while we witnessed a monkey popped out of nowhere with its middle finger pointing upwards. Subsequently, LWL took down her FB post and the monkey also hides itself. While the internet as well as international news portals were ignited with wild fires all around by this surprised family feud of the most powerful family in Singapore, I was first astonished but later felt that this is actually a good thing happening to Singapore, despite of the initial damage of Singapore's International reputation and standing. The initial accusation of building "political dynasty" by LWL and subsequent denial by PM Lee, would cast in stone that Singapore should not have and does not need any "political dynasty" to rule. Not now, not in the future. So whoever tried to put their sons or daughters to take over their political positions as a kind of "inheritance", should be checked and scrutinized vigorously. This saga will make anyone who wants to try to play the cards of "political inheritance" in future, think twice. They will have the hard time to justify such political maneuvers. In fact, PM Lee has stated very clearly in one of the earlier interview that his son has no interest whatsoever to join PAP or get into politics. This recent saga will further enhance the notion that there will be no "POLITICAL Dynasty" in the making. I hope that this will close the chapter of vast underground speculation of the creation of "political dynasty" in Singapore and we should not be expecting any child or grandchildren of PM Lee or his sibling to enter into Singapore politics in future. 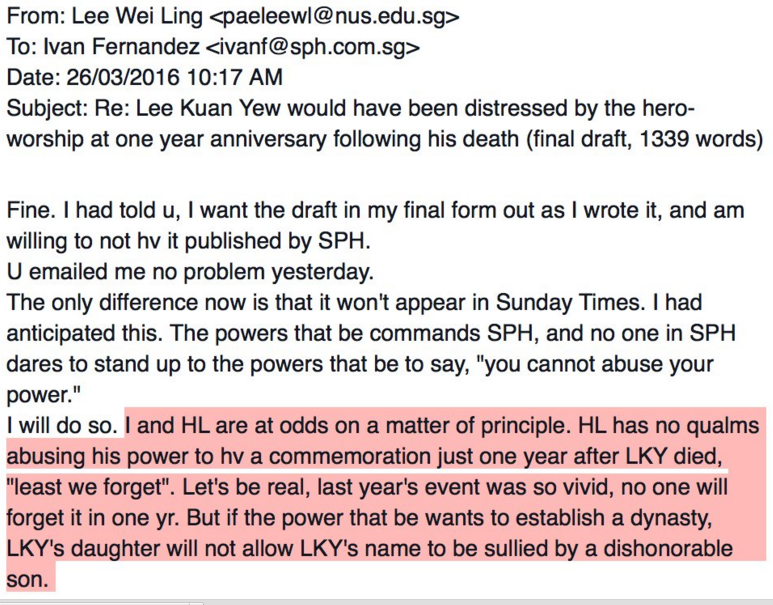 Else, if one day, any child from the most powerful family clan stepped into Singapore politics, we will be shocked and be reminded of LWL's accusation once again. It would be very difficult for anyone to justify that this is not "political dynasty" in the making. That will not be very healthy for Singapore as well as our reputation of our Nation. Goh Meng Seng, you should focus on how to make PPP strong to be able to win some seats like the WP in the next election. Once PPP can win some seats, then you can set the momentum to make it stronger and eventually ready to be govt to replace PAP. When that happens, whether there is a political dynasty or not becomes irrelevant. So enough of talking about PM Lee and PAP affairs and start minding your PPP affairs, if you want majority voters to treat you as a serious politician and PPP as a party that matters. Whenever people asked " where we are from?" Its either " Sorry its that in China?" Or the best " Oh that's LEE Kuan Yew or his son Lee Something".
" You never know how lucky you are ". was told to us. The so-cold experts should leave the gold-fish bowl family alone and concentrate on one nation, one country one Singapore and stop magnifying all the trivial daily family differences. Our Prime Minister was doing his duty what he thought best at that time as father and son are public figures. As Mr Lee's death was overly whelming, son's thought for the public instead of giving in to one. Even if it was not a mistake on the Mrs side it was a natural instinct defense for her husband though in event make in a spur of moment. If one look at them together as husband and wife, she seems like always on the look-out for him.